Kyle Wayland | Discounted Software for Schools, Teachers, and Students! Discounted Software for Schools, Teachers, and Students! New K12 Site license from Adobe! Adobe is offering Creative Cloud for Education Device Licenses through a new licensing option, the Adobe K-12 School Site License. This offering is available for primary and secondary or K-12 schools only. The Adobe K-12 School Site License allows a school to install Creative Cloud for education device licenses on at least 100 school-owned or school-leased computers. The Adobe Creative Cloud K-12 School Site License also comes with free access to the Adobe Education Exchange where teachers can download curriculum and share best practices with other teachers. License for each institutional computer – rather than per user. Device licenses can only be installed on a single computer and do not allow for a second installation. Online services are not included. Device licenses do not include cloud storage, Behance & Behance talent search, Adobe Typekit, PhoneGap Build, and Adobe Expert Services. Adobe Creative Cloud for Education ushers in a new era of creativity and collaboration that gives your students and teachers everything they need to capture inspiration and work together to create amazing content across desktop and mobile. Give your students and teachers the world’s best tools and services to help them collaborate, create, and publish: Adobe Creative Cloud for Education. What’s Included in Adobe Creative Cloud for Education (Device Licenses)? Adobe Photoshop CC – Edit and composite images, use 3D tools, edit video and perform advanced image analysis. Adobe Photoshop Lightroom CC – Organize, edit and batch-process all your digital photos in one intuitive library. Adobe Illustrator CC – Create vector-based graphics for print, web, video and mobile. Adobe InDesign CC – Design professional layouts for print and digital publishing. Adobe Muse CC – Create and publish dynamic websites without writing code. Adobe Premiere Pro CC – Edit video with high-performance, industry-leading editing tools. Adobe After Effects CC – Create industry-standard motion graphics and visual effects. Adobe Dreamweaver CC – Design, develop and maintain standards-based websites and applications. Adobe Flash Professional CC – Create rich interactive content across varied platforms and devices. Adobe Acrobat Pro DC – Create, protect, sign, collaborate on and print PDF documents. Adobe Audition CC – Create, edit and enhance audio for broadcast, video and film. Adobe SpeedGrade CC – Manipulate light and color in video footage. Adobe Prelude CC – Streamline the import and logging of video from any video format. Adobe InCopy CC – Enable writers and designers to work simultaneously on the same document. Adobe Bridge CC – Browse, organize and search your photos and design files in one central place. Adobe Flash Builder Premium – Build exceptional applications for Android, BlackBerry and iOS using a single codebase. Adobe Fireworks CS6 – Rapidly prototype websites and applications, and optimize web graphics. Adobe Edge Tools & Services – Optimize the look and performance of websites. Capture apps: Adobe Brush, Shape, Color and Hue – Capture inspiration around you and then bring it into your creative process across desktop and mobile devices. Design apps: Illustrator Draw, Illustrator Line, Photoshop Sketch, Comp and Preview – Create layouts and draw expressively on your mobile devices, and preview mobile designs on iOS devices. Visual storytelling apps: Slate, Premiere Clip and Voice – Craft visual stories and animated videos and edit with the power of Premiere Pro CC on mobile. Photography apps: Lightroom for mobile and Photoshop Mix – Bring the power of Adobe digital imaging to your mobile devices with full Photoshop and Lightroom compatibility. Community apps: Behance and Creative Portfolio – Showcase and discover creative work, and connect with the creative community. Centralized administration tools. Manage and track both Complete and Single-App seats from the handy Admin Console. Creative Cloud Packager. Centrally deploy apps and updates across your organization. Click here to watch a short video clip that explains the new Adobe Creative Cloud software. An all new desktop 3D printer capable of two-color printing in both ABS and PLA plastics, at resolutions as fine as 70 microns. Design models up to 6 x 6 x 6″ in volume, and the Cube 3 will build them by melting plastic in thin sheets, depositing layer upon layer until they form a three-dimensional object. Filament for the Cube 3 comes in redesigned smart cartridges that detect the type and quantity of material in the cartridge, which prompts the Cube to adjust printing settings accordingly. Cube 3 cartridges come in over 20 colors, which can be blended in several hundred combinations when using the dual-jet capability. Design your model in virtually any CAD software, and convert it to an .stl file for compatibility with the Cubify software. After the Cubify software converts your design to .cube3 format, transfer it onto the included USB stick and insert directly into your Cube, or send it wirelessly via Wi-Fi from your desktop or smartphone. The Cube 3 Printer is recommended for children 8+ and meets IEC Home Printer Certification 60953 (TUV). When printing with ABS, ensure adequate ventilation, as the oil-based plastic gives off fumes when melted. The fully-assembled Cube 3 comes with two PLA cartridges, typically neon green and white, but colors may vary. Also included are 25 free designs and a USB stick to help you start printing right out of the box. Smart, Moisture-Lock Cartridges 3D Systems redesigned their filament cartridges expressly for the Cube 3. Instant-load cartridges with non-clog technology and moisture-lock construction preserve the life and quality of the materials. The printer detects material type automatically based on the cartridge, eliminating the need to change print settings. Cubify Software The Cubify software is a free download that converts .stl and .creation files into .cube3 format, which is the only format your Cube will print. Most CAD software can create .stl files, but if you have .obj or other file formats, you’ll need to convert them to .stl before using Cubify to convert them further into .cube3 format. The Cube software works on both Windows and Mac OS X. Although the Cubify software lets you orient, scale, and add supports to your 3D model, it is not a design tool. Wired & Wireless Printing Transfer your completed designs to your 3D printer with the provided USB stick or via Wi-Fi from your desktop software. Precision & Print Mode The Cube 3 features an auto-leveling print pad that eliminates the human error possible with manual calibration. Your printer is also capable of very fine, precise printing at a 70-micron resolution – thinner than a piece of paper. Of course you can always choose faster printing, at 200 microns, when such detail isn’t necessary. As the higher education environment becomes more digital – and more global – it’s growing increasingly difficult for schools to provide access to software and data. Most departments and programs require unique solutions, and contracting for individual licenses can become a mess. Quite a few schools have also merged into city- and state-wide consortia, and many students need to access programs on multiple campuses. Overall, the device-centric model of computing (and contracting) just doesn’t work anymore. Fortunately, plenty of companies are now offering virtualization services that make the bring-your-own-device (BYOD) model feasible and affordable. Take the Lone Star College System, where Vice Chancellor Link Alander is implementing VMWare’s virtual desktop. Within the next year, Lone Star’s 90,000+ students and faculty will be able to use their own devices to access software and data from each of the system’s six campuses. Lone Star began redesigning its IT infrastructure three years ago with a focus on wireless density and centralization. “Networking isn’t just about wireless anymore – it’s about wireless density,” says Alander. Because of its growing student body and the increasing tech demands of its academic programs, the system needed a way to centralize email, productivity apps, and critical data. “The virtual desktop was the only way to provide a rich, quality experience and still meet legal requirements around licensing,” Alander says. For now, one Lone Star campus with roughly 7,000 students is taking advantage of the program. Students and teachers log in to a central hub for email and Office 365, as well as advanced editing tools like AutoCAD and Premier. Saving to the virtual desktop’s “My Documents” folder also routes their data to a private cloud. The virtual environment works on a variety of devices and operating systems, as well. A Lone Star poll revealed a 2.6 to 1 IP address-to-student ratio, so the desktop’s interoperability is clearly needed. Some classes even feature device-centric content – especially for iPads – but the virtual environment allows Windows and Mac users to stay on the same page. BYOD has generated some security concerns among educators, but Alander isn’t too worried. “Users are isolated to standard ports, and they’re not really ‘inside’ the network until they’re inside the virtual desktop,” he says. It’s not as if anyone can access every Lone Star folder from a mobile device; users with log-in credentials are confined to the specific files and apps provisioned to them via the desktop. Well, summer is almost here. Congratulations on making it through another year! I know that most schools have used up their budgets for FY15, so I figured it would be a good idea to mention how the new changes in Adobe’s site licensing program will affect the FY16 budgetary process. Remember the Creative Suite site licenses? You could buy a 250 or 500 seat of Design Standard, Design & Web, or Master collection. You would buy it, and own it. Not so much anymore. Adobe has gone to a subscription based system that will now license the entire school (regardless of how many computers you have). They are calling it the Educational Enterprise Agreement, or EEA for short. With EEA, the full Creative Cloud is installed on all devices across campus. The cost for EEA is determined by your FTE count. If your FTE is 20-69, your price point is $70 (x) your FTE number. If your FTE is 70 or higher, your price point is $40 (x) your FTE number. If my FTE is 82, I would pay 82×40= $3,280 per year to have all the computers in the school licensed with the latest Adobe software. As you can see, the price is lower than a typical CS6 site license and you can rest easy knowing that all the software is up to date. Furthermore, you have the option to lock that price in for two years—regardless of if your FTE changes! For some this is a good change. They can have the most up to date software, lock the price in for two years, and not worry about device limitations. For others…this is not a welcome change–and I understand that. Some schools will have a difficult time finding the funding every year. Regardless of your situation, I would love the opportunity to speak with you about your school’s potential for EEA school wide licensing. You can find more info on our website, here. For all Livescribe products, click here. I was talking about doing a write up for Oregon Trail for about a week. Well, this morning I got an email from eSchool News and guess what their featured piece was on…The Oregon Trail. The author, Suzi Wilczynski, does an amazing job of explaining the significance of the game, and its new found applications in STEM education. The link to the article is below, but I went ahead and copied it into this post. Walk into any bar and ask if someone remembers Oregon Trail. They’re bound to launch into a story about fording the river and losing all their supplies, how little Mary died of dysentery, or how their family’s wagon turned over on the journey. Oregon Trail defines an entire generation of adults. There’s a certain amount of childhood nostalgia that became visible in February as the 1990 version of the game became available to play for free, via the Internet Archive. What is it about Oregon Trail that had such a profound impact on us that we clearly remember the experience years later? Part of the answer lies in the way in which social studies is often taught. Despite the best efforts of teachers, history classes cover so much material that often the only choice is to focus on major events, dates, and important people. Not surprisingly, many kids find that sort of rote memorization boring and never truly engage with the material. That affects both comprehension and retention. Long after the test, students might remember the date of theBattle of Hastings, but the context and significance is often lost. Oregon Trail stemmed from the realization that kids learn more when they are learning about real people doing real things. Deeper learning happens when teachers show life and culture. If history is taught in this way, students can learn to analyze, categorize, process and communicate, and evaluate the motivation behind an action. When kids learn about real people who lived in the past, they begin to identify with them. They are able to see history as a story made up of patterns and repeating trends, not just a list of facts to memorize. That helps make the topic relevant to students and encourages them to apply those analytical skills to the world around them. When history becomes immediate instead of theoretical, it turns into an adventure instead of a chore. History taught in an immersive way helps students become engaged, excited, and eager to learn more. Part of what made Oregon Trail such an effective teaching tool was that it was structured as a game. Playing wasn’t about passing a test, it was about finding a way to get little Mary to the end without a catastrophe. Embedded in that experience was a variety of important information: certain foods are more nutritious or more durable than others; wagons are complicated machines that needed as much upkeep as a car does today; diseases were far more deadly in the past than they are now due to a lack of effective medication, etc. Learning was seamlessly blended with gameplay. Certainly, students learned about the dates the Oregon Trail was used, its geography, and its significance, but they also had a first-hand look into the very real hardships of the people who used it. That emotional connection to historic events is extremely powerful, as evidenced by the number of people who remember what they learned from a short game they played as children decades ago. Today, with the implementation of the Common Core state standards, there is an emphasis on making text-to-self connections, especially in the primary grades. The evidence shows that when students make an implicit connection between information and themselves, it is more likely the information is remembered later. Immersive games like Oregon Trail ask players, “What would you have done in that situation?” This is more powerful than just physically reading a textbook and absorbing the facts because of its emotional connection and cumulative learning effect. It forces students to draw on what they know and requires them to think differently about the information they’re receiving. Teachers have always known that games and learning belong together. Now we have remarkable technology available to us that makes the game experience more comprehensive and interactive than ever before. Immersive gaming today quite literally puts students in the shoes of someone else, providing a link between information and experience. These holistic experiences allow players to engage with a certain time period or environment as if they were there. In immersive games, history crosses the standard curricular boundaries and becomes a vehicle to build and apply higher-level skills. 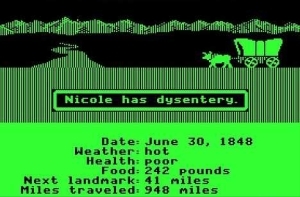 Oregon Trail was groundbreaking when it was first introduced and continues to be the gold standard against which all history games are measured. With the recent focus on STEM, social studies has taken a back seat. STEM is absolutely vital to our kids’ success, but kids also need the tools to analyze, process, and implement information that social studies courses provide. It is my hope that educators will continue to take advantage of the deeper learning provided by the immersive social studies games that have followed in the path blazed by Oregon Trail.